Compact footprint provides flexible installation options for new building and refurbishments. It can be placed closer to the lab reducing the cost and design implications of long pipe work loops. 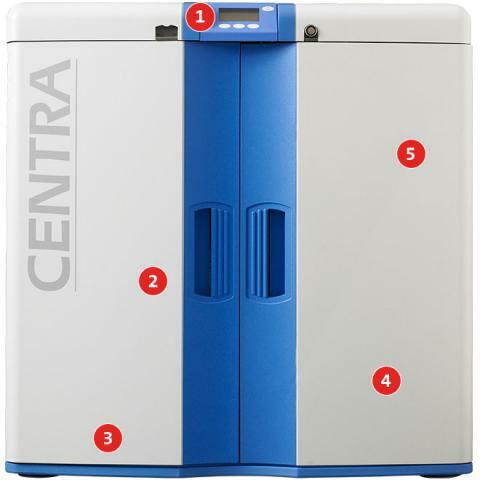 * specifications for CENTRA fitted with UV and optional deionization and microfilter. Without the deionization cartridge, the CENTRA will provide RO, permeate-grade III water with greater than 95% rejections of organics. TVC levels will typically be less than 5 CFU/ml and TOC less than 100 ppb. With the microfilter, TVC will fall typically to less than 1 CFU/ml and there will be particle removal to 0.2 um. specifications are for a system fed with a suitable water supply and installed, operated and sanitized according to the operator manuals.